Since we left Lisbon late we arrived at Gibraltar late. This might not have been such a bad thing since it gave me the opportunity to watch the ship dock. Something that normally takes place while I'm still asleep in the stateroom. As we approached the dock I spotted the QE2 already docked. 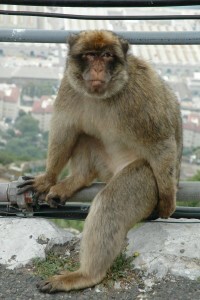 The apes provide much of the entertainment in Gibraltar. They're very rambunctious and like to jump on people's heads, steal hats and bags, and eat any food you may be carrying. 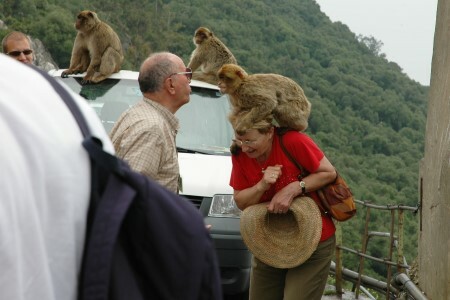 Superstition holds that if the Apes ever leave, so will the British, so they are well looked after by the government. St Michael's Cave in Gibraltar is probably the most interesting I've ever seen. Rather than the smooth formations I've seen before, the formations in the cave are unusually shaped with many stalactites and stalagmites joined to form immense vertical columns. One such group of formations is aptly named The Cathedral for its very cathedral like columns. 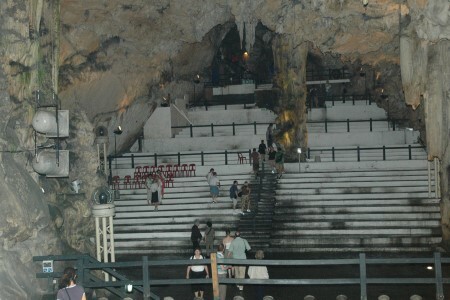 Another part of the cave has been carved out to form a large amphitheater where they have frequent concerts. It's too bad there was no performance when we were there because I'm sure between the lighting and the acoustics it would be very impressive. 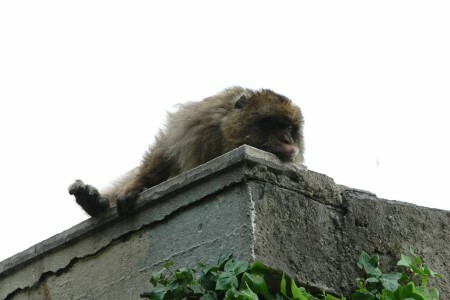 After leaving the caves we loitered around a bit observing the monkeys and waiting for the group to gather. 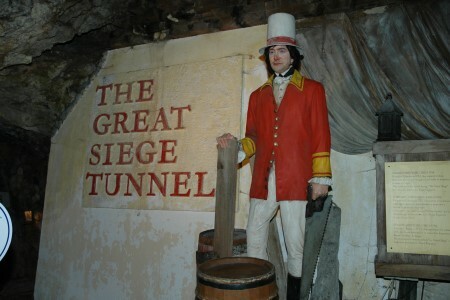 Once the group was back together we took a short ride to the Great Siege Tunnels. The tunnels have a very rich history. 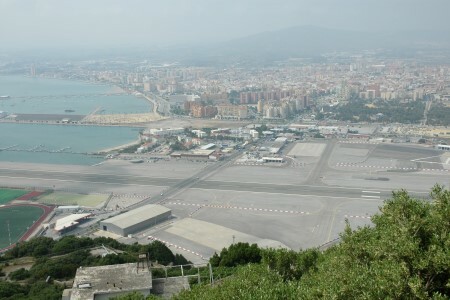 With Gibraltar being in such a strategic location at the mouth of the Mediterranean sea, it has been heavily used to prevent approaching armies from gaining access to routes that would let them conquer the lands they were after. During the American War of Independence, France and Spain tried to recapture the Rock from the British in what was called the Great Siege. The siege lasted from July 1779 to February 1783. 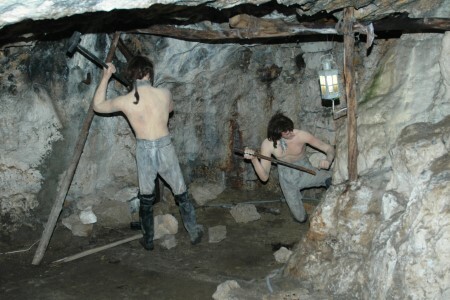 The tunnels were originally dug by hand using sledgehammers and crowbars along with gunpowder for blasting. During WWII royal engineers added an additional 30 miles of tunnels using diamond tipped drills. From the entrance of the Great Siege Tunnels there was a good view where you could see the border between Gibraltar and Spain. On the way back to the ship from the tunnels we passed Nefusot Yehuda Synagogue, one of Gibraltar's four synagogues. Gibraltar, it turns out, had a very high Jewish population dating back to the capture of Gibraltar by the British in 1704. Under British rule the Jewish community was permitted to resettle in this strategically vital southern tip of the Iberian Peninsula for the first time in 200 years. The oldest synagogue in Gibraltar, Sha'ar HaShamayim, or the Gibraltar Great Synagogue, is one of the oldest on the Iberian Peninsula dating back to 1724.